Little Painted Nails: Okay, I Get it...She's Faster Than Me! Kids are funny and expectation is even funnier. My eldest, Avery is getting ready to turn nine years old, and like most eight year olds her interests are as varied as her skill level in said interests. As a parent, we tend to overestimate our children’s abilities. I see it in soccer every year, “why isn’t Billy getting more playing time? He’s the best player out there!” My internal dialogue usually goes something like this “Because Billy (chose option) tackles other kids…asked to come out…is hiding in the net…has to potty…is thirsty, hungry, tired”. But I’m the same. To me, all of my kids are the smartest, funniest, prettiest and most athletically gifted. It’s probably not true but good luck convincing me of that. That brings me to this week. I’ve always known that Avery was a very good runner. She has always had a unique ability to run for days. I've been hesitant to consider her to be as fast as she actually is. She's fast, but coming from her parent's stock, how fast could she actually be? Her soccer coaches recognize it. She has always earned extra playing time because she always appears fresh regardless of how long she has played in a game. Her P.E. coach has acknowledged on a number of occasions that perhaps Avery belongs on a track team of some sort citing her form and her endurance. Last weekend she ran in a 5K and did very well…and I mean VERY well. She finished third out of the youth group. This means she was third out of 112 kids aged 15 and under. The race director pulled me aside and questioned whether or not she had actually run the race and despite my verification, the director didn’t believe me. He was ready to award her medal to someone else and I couldn't believe it. It wasn’t until another woman who ran with Avery confirmed that Avery had blown by her at the second mile marker that she was allowed to receive her medal. Yesterday, the track coach from what will be Avery’s middle school reached out to my wife asking if she would be continuing to compete. Middle school is three years away. It seemed like a crazy conversation to be having. Frankly, all of this seemed crazy. The medal, the sub 24 minute time, the call from the middle school track coach. It would have all seemed even crazier if it weren’t April Fools Day, but alas, here we are. Happy April Fools Day! 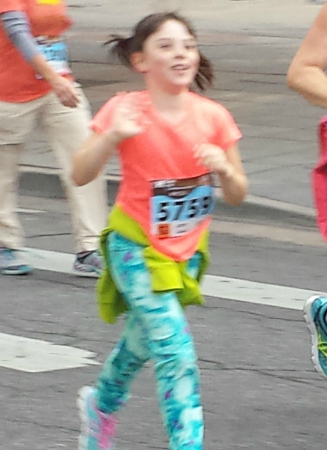 I hate this one - I was totally jazzed that she runs like the Flash!